1-Use a basic screw pull, it works best. 2-Twist the length of the corkscrew through the center of the cork. 3-Attach metal edge to lip of bottle. Pull out cork in one motion. 4-Hold the bottle in your right hand close to the base, and make sure not to cover the label. Pour a small amount to taste first. 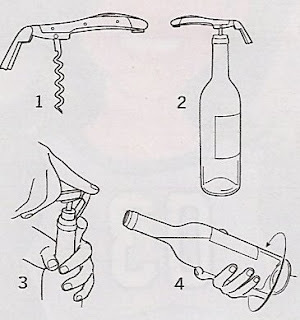 To prevent the wine from dripping, turn the bottle clockwise as you finish pouring. 5-Fill glasses quarter to a third of the way, less for red and more for white. This will allow the wine's aromas to open up and you can fully appreciate the flavors.